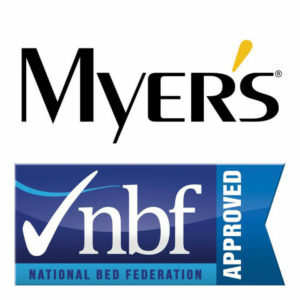 Updated Myers Mattresses lead to ex display bargains!! We regularly update our product ranges and following on from the National Bed Federation show in September we are about to take delivery of 4 new Myers mattresses for our showroom. This of course means that we some ex display mattresses to sell. These are available at a substantial discount on a first come basis – once they are gone they are gone!! We have 1 x 4’6″ Myers Latex comfort 1800 pocket sprung mattress, 1 x 4’6″ Myers Memory Comfort 1400 Pocket Sprung mattress, 1 x 4’6″ Myers Ortho Pocket 1500 Pocket Mattress and 1 x 4’0″ Myers Ortho Pocket 800 Mattress all at ex display prices!! These plus many more great deals on your next bed or mattress right here in Morecambe! !